I saw a post on the VMTN forums the other day about unregistering a vCenter plugin. The user had a bad installation of an early preview of NetApp's VSC utility. After uninstalling the plugin, the user was still unable to unlink the plugin from vCenter. There is actually a pretty simple solution to this problem which can be accomplished by using the vSphere MOB. 1. Point your web browser to your vCenter server: https://your_vc_server/mob and login. You can now refresh the page and you will see that the plugin is no longer available. You can restart your vSphere Client to see that the plugin has now been removed. How to easily disable vMotion & Cross vCenter vMotion for a particular Virtual Machine? An update on how to retrieve useful information from a vSphere login? Thx dude for this, solved a problem I had for months. Presumably this could be scripted with PowerCLI? I’m guessing you’d need Get-View which might be beyond my skills. 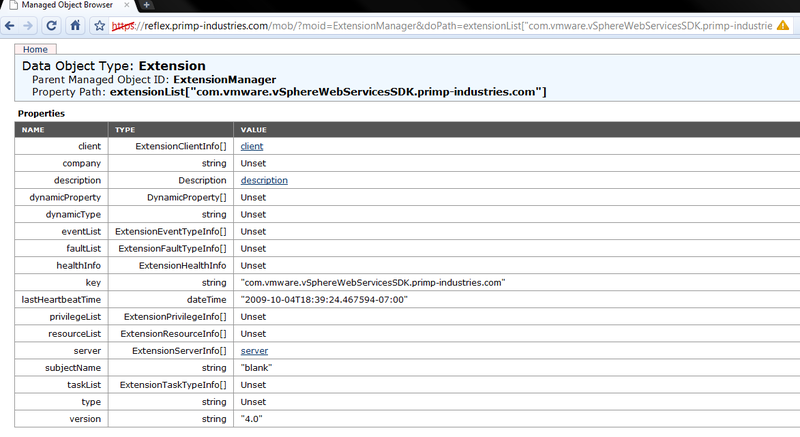 That’s correct, this just uses the vSphere API, so this can be re-written in any of the vSphere SDK’s. 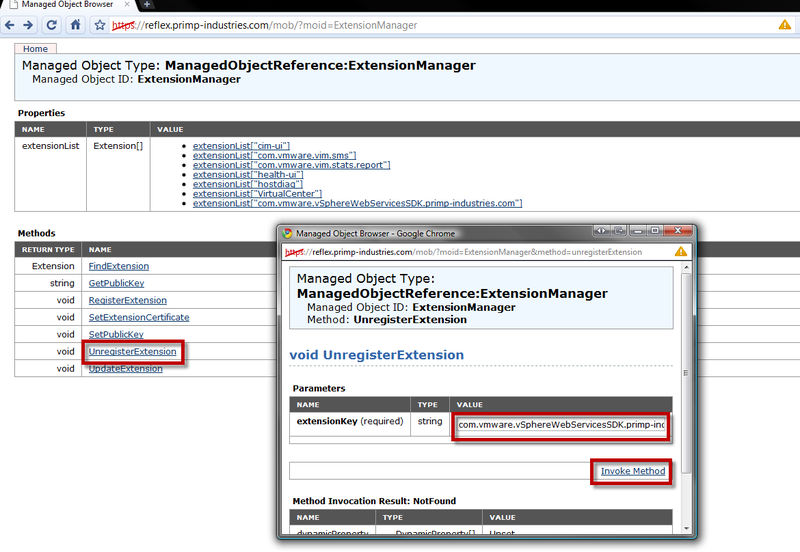 You will need to get a reference to Extension Manager to perform operations for the plugins. Thanks so much! Needed this to remove NetApp VSC 1.0 plugin. Cool, William. But how to execute some task from some extension. F.E. there is com.vmware.vcIntegrity in the extension’s list. And this extension has some tasks. Could you execute some ? Excellent guide, removed the vCenter Operations Manager plugin with succes! Exactly what I needed. Simple and effective. Thanks! Thanks, William. Needed this method to unregister a Dell vCenter Plugin that was outdated. Nearly 3 years later, this is still helpful! Thanks, William! Thank you very much for this, had to unregister a broken veeam plugin and this worked like a charm! Jonathan Medd wrote up some PowerCLI functions for removing vCenter plugins here. Nice work!